Tassili n'Ajjer (Berber: Tasili n Ajjer, Arabic: طاسيلي ناجر‎; "Plateau of the Rivers") is a national park in the Sahara desert, located on a vast plateau in south-east Algeria. Having one of the most important groupings of prehistoric cave art in the world, and covering an area of over 72,000 km2 (28,000 sq mi), Tassili n'Ajjer was inducted into UNESCO's World Heritage Site list in 1982. The rock formation is an archaeological site, noted for its numerous prehistoric parietal works of rock art, first reported in 1910, that date to the early Neolithic era at the end of the last glacial period during which the Sahara was a habitable savanna rather than the current desert. Although sources vary considerably, the earliest pieces of art are assumed to be 12,000 years old. The vast majority date to the 9th and 10th millennia BP or younger, according to OSL dating of associated sediments. Among the 15,000 engravings so far identified depicted are large wild animals including antelopes and crocodiles, cattle herds and humans that engage in activities such as hunting and dancing. According to UNESCO, "The exceptional density of paintings and engravings...have made Tassili world famous." Tassili n'Ajjer is a vast plateau in south-east Algeria at the borders of Libya, Niger and Mali, covering an area of 72,000 km2. It ranges from 26°20′N 5°00′E﻿ / ﻿26.333°N 5.000°E east-south-east to 24°00′N 10°00′E﻿ / ﻿24.000°N 10.000°E. Its highest point is the Adrar Afao that peaks at 2,158 m (7,080 ft), located at 25°10′N 8°11′E﻿ / ﻿25.167°N 8.183°E. The nearest town is Djanet, situated around 10 km (6.2 mi) southwest of Tassili n'Ajjer. The archaeological site has been designated a national park, a Biosphere Reserve (cypresses) and was induced into UNESCO's World Heritage Site list as Tassili n'Ajjer National Park. The plateau is also of great geological and aesthetic interest. Its panorama of geological formations of rock forests, which comprises eroded sandstone, resembles a strange lunar landscape. The range is composed largely of sandstone. The sandstone is stained by a thin outer layer of deposited metallic oxides which color the rock formations anywhere from near-black to dull red. Erosion in the area has resulted in nearly 300 natural rock arches being formed, along with many other spectacular landforms. The ecology of the Tassili n'Ajjer is more fully described in the article West Saharan montane xeric woodlands, the ecoregion to which this area belongs. The literal English translation of Tassili n'Ajjer is 'Plateau of the rivers' referring to a time when the climate was repeatedly far wetter than it is today (see Neolithic Subpluvial). Relict populations of the West African crocodile persisted in the Tassili n'Ajjer until the 20th century. Various other fauna still reside on the plateau, including mouflons, the only surviving type of the larger mammals depicted in the area's rock paintings. Anonymous reproduction of the Tassili mushroom man Matalem-Amazar found in Tassili. One at the most important scenes is to be found in the Tin-Tazarift rock art site, at Tassili, in which we find a series of masked figures in line and hieratically dressed or dressed as dancers surrounded by long and lively festoons of geometrical designs of different kinds (fig. 2). Each dancer holds a mushroom-like object in the right hand and, even more surprising, two parallel lines come out of this object to reach the central part of the head of the dancer, the area of the roots of the two horns. This double line could signify an indirect association or non-material fluid passing from the object held in the right hand and the mind. This interpretation would coincide with the mushroom interpretation if we bear in mind the universal mental value induced by hallucinogenic mushrooms and vegetals, which is often of a mystical and spiritual nature (Dobkin de Rios, 1984:194). It would seem that these lines – in themselves an ideogram which represents something non-material in ancient art – represent the effect that the mushroom has on the human mind. [...] In a shelter in Tin – Abouteka, in Tassili, there is a motif appearing at least twice which associates mushrooms and fish; a unique association of symbols among ethno-mycological cultures (fig. 5). Two mushrooms are depicted opposite each other, in a perpendicular position with regard to the fish motif and near the tail. Not far from here, above, we find other fish which are similar to the aforementioned but without the side-mushrooms. This theory was reused by new-age icon Terence McKenna in his 1992 book Food of the Gods, hypothesizing that the Neolithic culture that inhabited the site used psilocybin mushrooms as part of its religious ritual life, citing rock paintings showing persons holding mushroom-like objects in their hands, as well as mushrooms growing from their bodies. For Henri Lohte who discovered the Tassili caves in the late 1950s, these were obviously secret sanctuaries. The painting that best backs the mushroom hypothesis is the Tassili mushroom man Matalem-Amazar where the body of the represented shaman is covered with mushrooms. According to Earl Lee in his book From the Bodies of the Gods: Psychoactive Plants and the Cults of the Dead (2012), this imagery refers to an ancient episode where a "mushroom shaman" was buried with his clothes, and when unearthed some time later, his body was covered with tiny mushrooms growing in his clothes. Earl Lee considered the mushroom paintings at Tassili fairly realistic. According to Brian Akers, writer of the Mushroom journal, the fungoid rock art in Tassili does not resemble the representations of the Psilocybe hispanica in the Selva Pascuala caves (2015). The art at Tassili is not even considered realistic. Tassili is the recording location and the title of a 2011 album by the Tuareg-Berber band Tinariwen. Tassili Plain is a track on the 1994 album Natural Wonders of the World in Dub by dub group Zion Train. Bahn, Paul G. (1998) The Cambridge Illustrated History of Prehistoric Art Cambridge, Cambridge University Press. Bradley, R (2000) An archaeology of natural places London, Routledge. Chippindale, Chris and Tacon, S-C (eds) (1998) The Archaeology of Rock Art Cambridge, Cambridge University Press. Clottes, J. (2002): World Rock Art. Los Angeles: Getty Publications. 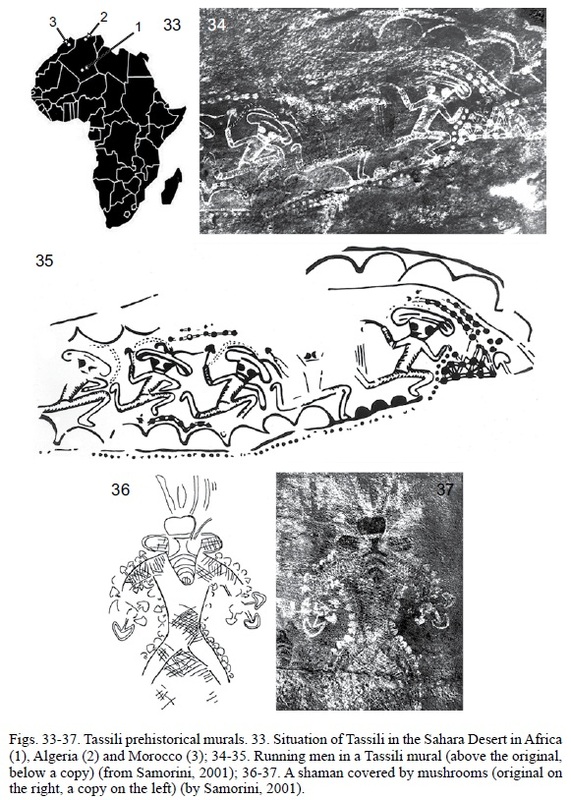 Coulson, D and Campbell, Alec (2001) African Rock Art: Paintings and Engravings on Stone New York, Harry N Abrams. Lajoux, Jean-Dominique (1977) Tassili n'Ajjer: Art Rupestre du Sahara Préhistorique Paris, Le Chêne. Lajoux, Jean-Dominique (1962), Merveilles du Tassili n'Ajjer (The rock paintings of Tassili in translation), Le Chêne, Paris. Le Quellec, J-L (1998) Art Rupestre et Prehistoire du Sahara. Le Messak Libyen Paris: Editions Payot et Rivages, Bibliothèque Scientifique Payot. Lhote, Henri (1959, reprinted 1973) The Search for the Tassili Frescoes: The story of the prehistoric rock-paintings of the Sahara London. Lhote, Henri (1958, 1973, 1992, 2006) À la découverte des fresques du Tassili, Arthaud, Paris. Mattingly, D (ed) (forthcoming) The archaeology of the Fezzan. Muzzolini, A (1997) "Saharan Rock Art", in Vogel, J O (ed) Encyclopedia of Precolonial Africa Walnut Creek: 347-353. Van Albada, A. and Van Albada, A.-M. (2000): La Montagne des Hommes-Chiens: Art Rupestre du Messak Lybien Paris, Seuil. Whitley, D S (ed) (2001) Handbook of Rock Art Research New York: Altamira Press. ^ "La Vallée d'Iherir". Ramsar Sites Information Service. Retrieved 25 April 2018. ^ a b Centre, UNESCO World Heritage (11 Oct 2017). "Tassili n'Ajjer". UNESCO World Heritage Centre. ^ "Rock Art of the Tassili n Ajjer, Algeria" (PDF). Africanrockart.org. Retrieved February 7, 2017. ^ a b "Tassili-n-Ajjer". britannica. Retrieved February 7, 2017. ^ "Tassili N'Ajjer (Algeria)". Africanworldheritagesites.org. Retrieved February 7, 2017. ^ Mercier, Norbert; Le Quellec, Jean-Loïc; Hachid, Malika; Agsous, Safia; Grenet, Michel (July 2012). "OSL dating of quaternary deposits associated with the parietal art of the Tassili-n-Ajjer plateau (Central Sahara)". Quaternary Geochronology. 10: 367–373. doi:10.1016/j.quageo.2011.11.010. Retrieved 7 March 2013. ^ a b c d e Scheffel, Richard L.; Wernet, Susan J., eds. (1980). Natural Wonders of the World. United States of America: Reader's Digest Association, Inc. pp. 371–372. ISBN 978-0-89577-087-5. ^ "Tassili n'Ajer". UNESCO World Heritage Centre. Retrieved 7 March 2013. ^ "Tassili n'Ajjer National Park, Djanet". Algeria.com. Retrieved February 7, 2017. ^ "Tassili National Park, Sahara Algeria". Archmillennium.net. Retrieved 2012-12-16. ^ McKenna, Terence (1992). Food of the Gods. United States and Canada: Bantam Books. pp. 72, 73. ISBN 978-0-553-07868-8. Adjahil (also written Ajahil) is a village in the commune of Djanet, in Djanet District, Illizi Province, Algeria. It is in the same valley as the district capital Djanet, which is 3 kilometres (1.9 mi) to the north. Along with the other localities near Djanet it lies on the south-western edge of the Tassili n'Ajjer mountain range. The Algerian Desert (Arabic: الصحراء الجزائرية‎) is located in north-central Africa and is part of the Sahara Desert. The desert occupies more than four-fifths of the Algerian territory. Its expansion starts from the Saharan Atlas, more or less as a stony desert and the farther inland you get the more of a sand dune desert it becomes. In the southeastern parts is the mountain range Tassili n'Ajjer located. This area is a subject of great archaeological interest and was put up on the "World Heritage List" by UNESCO in 1982. The area is known for extreme aridity and extreme heat, as daytime temperatures are commonly between 46 °C (113 °F) and 51 °C (122 °F) during the hottest period of the year in most of the desert. Cities and towns such as Ouargla, Touggourt, Beni Abbes, Adrar, In Salah are among the hottest places on Earth during the height of summer. Annual average rainfall is well below 100 mm (3,93 in) in the northernmost part but the center and the southern part receive much less than 50 mm (1,96 in) and are therefore hyper-arid and among the driest places on Earth. The archeology in Algeria is rich in prehistoric memorials of human occupation. Algeria contains many Roman remains and is rich in monuments of Saracenic art. Azelouaz is a village in the commune of Djanet, in Djanet District, Illizi Province, Algeria. It is in the same valley as the district capital Djanet, which is 2.5 kilometres (1.6 mi) to the south. Along with the other localities near Djanet it lies on the south-western edge of the Tassili n'Ajjer mountain range. Eferi is a village in the commune of Djanet, in Djanet District, Illizi Province, Algeria. Along with the other localities near Djanet it lies at the south-western edge of the Tassili n'Ajjer mountain range. El Mihan is a village in the commune of Djanet, in Djanet District, Illizi Province, Algeria. It is in the same valley as the district capital Djanet, which is 1 kilometre (0.62 mi) to the north. Along with the other localities near Djanet it lies on the south-western edge of the Tassili n'Ajjer mountain range. Iherir (also written Ihrir) is a village in the commune of Bordj El Houasse, in Djanet District, Illizi Province, Algeria. It is in a river valley (wadi) named Oued Iherir near the center of the Tassili n'Ajjer mountain range, 121 kilometres (75 mi) south of the provincial capital Illizi. The area has been populated since Neolithic times; the population living in the valley (including a village to the southeast called Idarane) has been continuously over 1000 during the 20th century. Illizi (Arabic: إيليزي‎) is a town and commune, coextensive with Illizi District, situated in the south-eastern part of Algeria, and capital of Illizi Province. According to the 2008 census it is the largest commune by population in the province, with a population of 17,252, up from 10,163 in 1998, and an annual population growth rate of 5.5%, the highest in the province. It is one of the gates to the Tassili N'Ajjer National Park with caves situated under the sands containing prehistoric drawings dating from 6000 years BC. There is a hotel and two camping sites, as well as many local tourist agencies. Jebel Azao or Adrar Afao is the highest peak in the Tassili n'Ajjer range in southeastern Algeria, at 2,158 metres (7,080 ft). The range forms the northwest border of the Chad Basin. The Kel Adagh (var. Kel Adrar, Kel Adghagh, less commonly Kel Ifoghas) are a Tuareg confederation of clans (or "Drum-Groups") living in the region of the Adrar des Iforas highlands in Mali. The name comes from Tamasheq "Kel" ("those from/of") and "Adagh" ("Mountains"). In the modern era, not all Tuareg in the Adrar des Iforas are Kel Adagh, while some Kel Adagh are spread through northern Niger and southern Algeria, with populations in the Aïr Mountains, Tassili n'Ajjer, and the Hoggar Mountains. Most Kel Adagh derive from Noble and Warrior castes and their tributaries. Kel Afella (North) : tributaries of the Amenokal of Adagh. Mount Tahat (Arabic: جبل تاهات‎) is the highest mountain peak in Algeria. It sits at an elevation of 2,908 metres (9,541 ft). Other sources indicate an elevation of 3,003 metres (9,852 ft). Tahat is also the highest peak in the Hoggar Mountains. Its nearest city is Tamanrasset which is located 56 km to the south. Mount Tahat is of volcanic origin. It is located in an arid, rocky high plateau area of the central Sahara Desert. The Tuareg inhabit this region. To the north lie the Tassili n'Ajjer mountains, which contain cave paintings dating from a period between 8000 and 2000 BC. The rock art is pastoral, showing cattle breeding and hunting of animals that are today exclusively found in the southern Sahara's climate. The Murzuq Desert, Idehan Murzuq, Idhan Murzuq, (also Murzaq, Murzuk, Marzuq and Murzak), is an erg in southwestern Libya with a surface of approximately 58,000 km2. It is named after the town of Murzuk in the Fezzan. Like the Idehan Ubari further north, the Idehan Murzuq is part of the greater Sahara Desert region. It is separated from the southern Sahara Desert by the Tibesti Mountains and the Tassili n'Ajjer. Saharan rock art is a significant area of archaeological study focusing on artwork carved or painted on the natural rocks of the central Sahara desert. The rock art dates from numerous periods starting c. 12,000 years ago, and is significant because it shows the culture of ancient African societies. The paintings and carvings of the Sahara are endangered, and vulnerable rock art on uncovered rock has already disappeared. Organizations such as the Trust for African Rock Art are researching and recording as much information about Saharan rock art as possible, while raising awareness of threats to the art itself. Tamadjert (also written Tamdjert or Tamadjart) is a village in the commune of Illizi, in Illizi Province, Algeria. It is located in the Tassili n'Ajjer mountain range at the western edge of the Tassili n'Ajjer National Park. The village is the site of a project to introduce solar energy to Algeria, with 48 households connected to 8 solar power systems. Tamanrasset or Tamanghasset (Arabic: ولاية تمنراست‎ Wilāya Tamanrāssat) is the largest province (wilaya) in Algeria. It was named after its province seat, Tamanrasset. The province has two national parks, more than any other in Algeria. They are Tassili n'Ajjer National Park and Ahaggar National Park. The province makes up almost a quarter of the country's area with 556,200 km². Tarat is a village in the commune of Illizi, in Illizi Province, Algeria, located near the border with Libya beside a wadi beneath the eastern edge of the Tassili n'Ajjer mountain range. Tin El Koum (also written Tin Alkoum) is a village in the commune of Djanet, in Djanet District, Illizi Province, Algeria. It is located in the same valley as Ghat in Libya, deep within in the south-eastern Tassili N'Ajjer mountain range, east of Djanet. It is the location of a border crossing into Libya which is controlled by independent Tuareg militias in the Libyan civil war. The West Saharan montane xeric woodlands is an ecoregion that extends across several highland regions in the Sahara. Surrounded at lower elevations by the largely barren Sahara, the West Saharan montane xeric woodlands are isolated refuges of plants and animals that can survive in the higher humidity and lower temperatures of the highlands.